You know how we've been stressing the importance of a great coat this winter? Remember that nagging voice in the back of your head that won't allow you to drop a ton of cash on, like, a mauve coat? Silence it! Dorothy Perkins just revealed a final sale that we're not letting you ignore. Pay particular attention to the coats and outerwear section, where you can practically steal a colorful, stylish, new coat that you haven't tried before. This sale is kind of silly it's so good, and you've got plenty of outerwear to choose from (and a cray-cray selection of $17 dresses), but today our focus is on coats, because the temperature reads precisely annoying degrees outside. You definitely need to use a discerning eye, not all sale items are worthy of your wardrobe, but a little patience and motivation (the tools of any stealth shopper), will help you find something amazing. Skeptical about a sale find? Leave your questions in our comments section. We'll help. 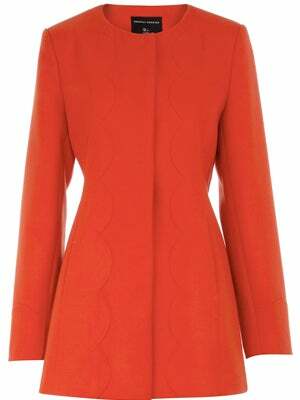 Dorothy Perkins Orange scallop minimal coat, $35, available at Dorothy Perkins.